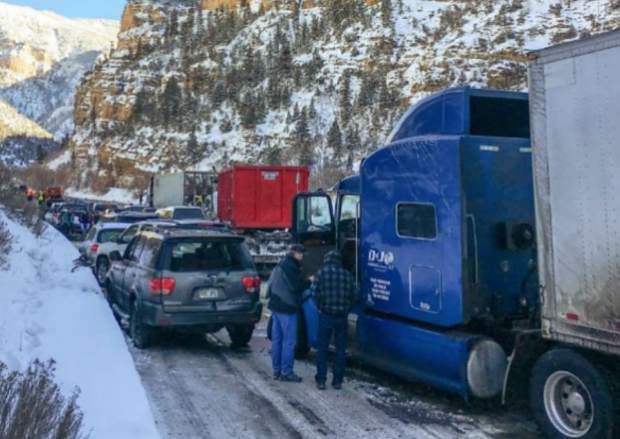 Drivers wait out a closure in icy conditions in Glenwood Canyon in January. Speed limits through Glenwood Canyon will vary from 30-60 mph starting in November after new technology is installed to monitor conditions, the Colorado Department of Transportation said Monday. CDOT said it will begin preliminary work on a project this fall meant to enhance safety on Interstate 70 through the canyon just east of Glenwood Springs, which is deemed particularly hazardous in bad weather. The variable speed limit project will install interconnected weather and road sensors, cameras, speed detection devices and speed limit message boards at 17 locations. The work will be done across approximately 14 miles eastbound from about mile 117, just east of Glenwood Springs, to about mile 131; and approximately 15 miles westbound from roughly mile 131 to just past Exit 116. The equipment installation is planned through October. • Installing three stations for live monitoring and reporting of weather conditions. • Installing 73 standard signs. • Installing 17 new variable speed limit signs. • Replacing five variable speed limit signs. • Removing 38 existing static signs. • Installing nine closed-circuit cameras for live monitoring of roadway conditions. • Adding other surface and subsurface conduit and related equipment to guide the display of the variable speed limits. CDOT said these changes will give drivers advance warning and generate a safer traffic flow to decrease accidents in the canyon. The technology will increase the standard speed limit during good conditions to 60 mph for passenger vehicles and 50 mph for heavy vehicles (over 26,000 gross vehicle weight), in most areas of the canyon. This technology — operated by people and the technology itself — will lower the speed limit to assist with incident management, conditions created by bad weather, and maintenance and construction. Traffic engineer Michael Curtis said that could go as low as 30 mph.